LBBG 2cy, September 30 2001, Le Portel, NW France. As commonly seen in 2cy LBBG, by September the scapulars show grey adult-like feathers randomly. The new median coverts are still growing, the inner 3 greater coverts are new as well. The lesser coverts are a mix of old abraded feathers and fresh greyish coverts. The upper 3 tertials were moulted recently. 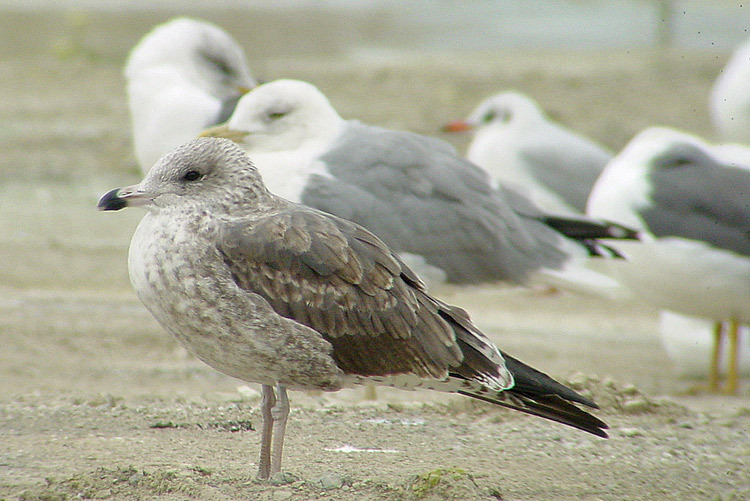 In the background an adult Yellow-legged Gull (L. michahellis).